Coming Soon – New Poetry Books! I am so happy to announce that I will have a new chapbook available for you soon as well as new tiny books of poetry. The new chapbook is titled A Field Guide to Angels and will be available through lulu.com or you will be able to order it directly from me. There are 4 new tiny books, Mornings on the Cove 1 and 2 and A Field Guide to the Constellations 1 and 2. These can be ordered in sets or singly, directly from me with PayPal. There are also a few of the previous tiny books still available, Love Poems and Lullaby, but the numbers are limited. I am so excited to share these with you and hope you will enjoy them. 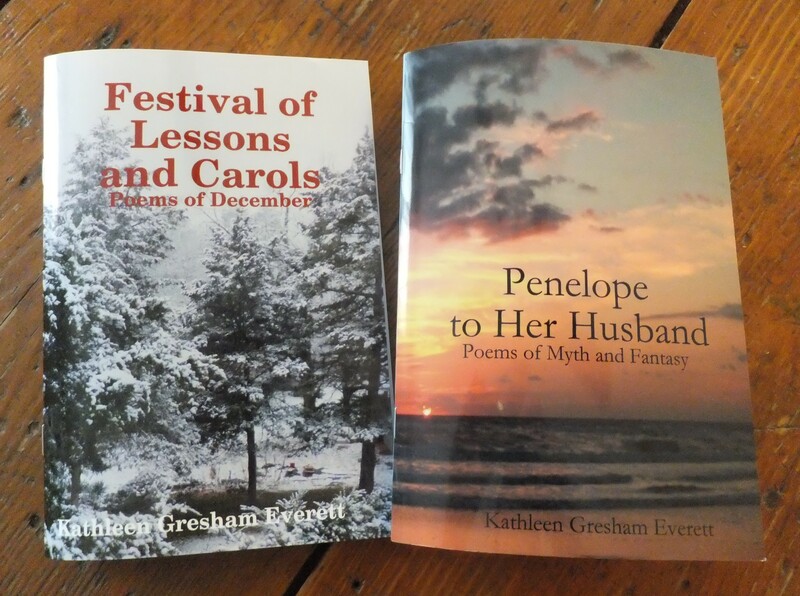 My two chapbooks, Festival of Lessons and Carols and Penelope to Her Husband, Poems of Myth and Fantasy, are still available from Everdale Publishing through lulu.com. The first is a compilation of my December poems for the seasons of Advent, Christmas and the winter solstice, Festival of Lessons and Carols. The second book is Penelope to Her Husband, Poems of Myth and Fantasy, a retelling of myths, faerie tales, fables, with old and new characters that I hope will charm you. A perfect gift for friends and family. Or for when you have those quiet moments to reflect on this wonderful time of year.